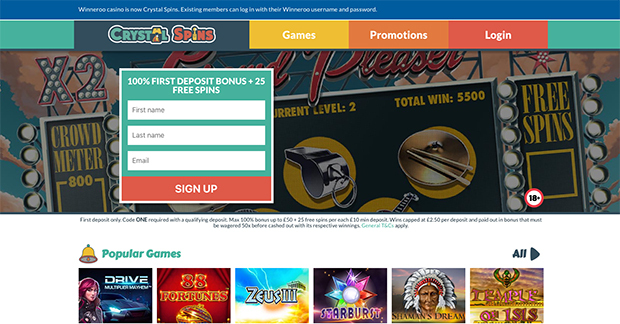 Internet casino Winneroo has re-branded this week, becoming CrystalSpins Casino. The re-branding is a way for parent company 888 Holdings to give a more direct name for the services that the casino offers. Primarily, CrystalSpins is a slot provider, but the company does also offer blackjack, roulette, keno, and scratch cards to their customers. Of particular note to readers of Online Blackjack is the CrystalSpins live dealer casino, which offers a webcast version of the game that plays just like you’re at a brick and mortar spot. In addition to the live dealer game, there are five other blackjack titles on the CrystalSpins roster. You’ll find straight blackjack, Blackjack Classic, Single Deck, Multi-hand, and Super Stakes Blackjack. The games are all pretty straightforward and allow players to get in on the games from the comfort of their own homes. Winneroo had been in operation since 2012, offering players in regulated jurisdictions such as the UK the chance to play their assortment of casino games. The site offers play on desktop and mobile devices and has been generally well-regarded because of their reputable payout history, good selection of games and solid management.